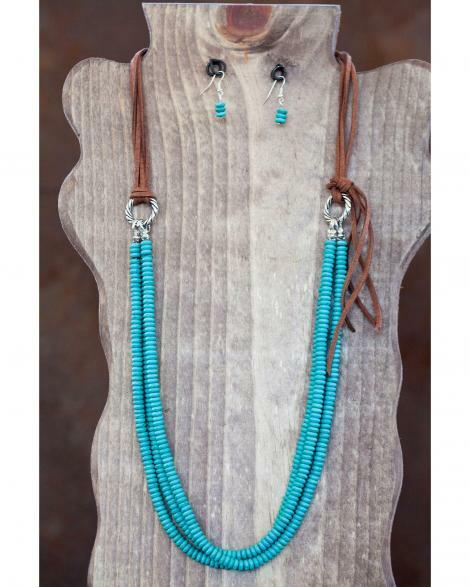 As I was scrolling through Instagram the other day, oogling all the Denver Market finds that different venders were posting, I came across a Bohemian/Gypsy style Necklace on the Double J Saddlery page. I of course “hearted” it because it was such a great piece. The combination of leather and pearls, really struck a chord with me. Isn’t that what every girl who loves horses is; a deadly combination of denim and diamonds, leather and pearls? Being the bargain shopper that I am, I started scouring the internet for more of these necklaces. NRS Roping Supply , Sheplers and a few other western retailers were carrying what I craved but with much distain I discovered the price tags. I’m sorry but $40 for some leather cording and beads was not floating my boat. So being the cheap person that I am, I started searching through my box of unused jewelry, my bins of craft projects gone wrong and the stashed box of gifts I couldn’t take back. The pull of the gypsy, bohemian style is that of ease and using what you have or can find, that being said, here is my DIY Bohemian Necklace. The supply list is what I used but should be considered more of a guideline. Empty the junk drawer! Step 1: Remove the clasp from your “pearl” necklace but leave the rings. Then stash the clasp back in the junk drawer for your next genius DIY project. Step 2: Cut two equal length pieces of lacing (mine were roughly 4” each but I ended up trimming them) and feed them through the jump rings you left attached to the necklace. Tie the lacing pieces to your center metal finding and cut the tail ends to your preference. Step 3: Find the center of the beaded necklace and cut it. Using the D rings (or my case triangle pieces) and leather cording, tie the pearls to the D rings and then cut another long piece to go around your neck and secure the two Ds together. I left the tails because I thought they added character. Step 4: Cut four equal pieces of lacing, double over and tie them to the center ring. Be sure to share your creations with me on social media using #kimesranchDIY.